My house also had an explosion of bows. 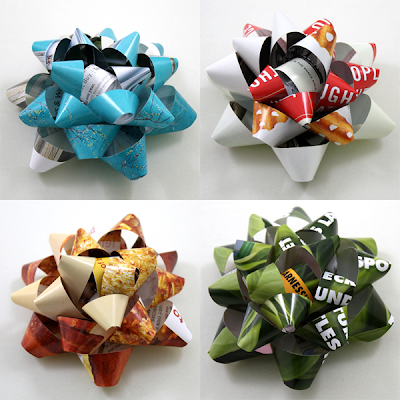 I found this cool topo paper and we had map bows and holiday catalog bows. Thanks for the tut!! i like how each of hers has a color theme. Those are much more fun than the ribbon bows. I may never go back! Thanks for the post! what a clever idea!!! reuse reuse reuse revolution! the color is so much more fun with all the variety. I LOVED that tutorial. It is so neat to see a whole bunch of these. I think one day I may dedicate some time to making a lot of bows so I have a stockpile ready for gifting. I have to say thank you for that Bow post. I love your blog and it helped inspired me to give the blog world a whirl. I wanted to say, Thanks for the inspiration!!! Also - I created that bow MANY times since reading your post, and in many different ways. Thank you for that, too! My first post back in October. I made a few of the bows using your tutorial--it was fun! Thank you for the wonderful directions. I love this project, I used that tutorial to make all of my christmas bows! Wow! These are gorgeous. See what you've done..? Another happy hobby virus takes off from How About Orange.. Thanks for posting a link to my flickr set - and thanks again for providing the amazing tutorial! Holy wow! Those are awesome!!! I love this idea! I also love your blog. I want my blog to be like yours when it grows up. I thought you might like this post about someone else's love of orange: http://poppiesatplay.blogspot.com/2010/01/orange-crush.html. Great blog, by the way! Totally inspiring! There are loads of blocks to choose from - to unleash your creativity. These were a great idea. I totally yoinked it for myself! Thanks so much for the innovativeness! I don't usually try watever crafts i see, but as soon as i saw the post on how to do this, i just think i should do it myself! It was fun! I really love the idea! Thank you for sharing!! Those look great! I showed my boyfriend your tutorial back in December and he ended up making bows using a Chinese newspaper he bought especially for the project. His family were very impressed when they received their Christmas gifts and heard that he'd made the ribbons. those are fantastic! i can't wait to try my own! I blogged just before Christmas about this from your site, but never tried them. I'm a high school art teacher. 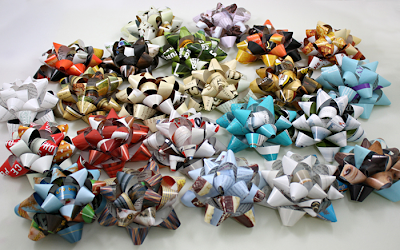 As students were finishing up their projects before the holiday, I taught them how to make your bows. I love to teach them ways to reuse and recycle, and this was such a welcome, timely post. They loved it! Thank you so much! a very nice and useful tutorial! I made lot of bows and I decorated all of my Christmas gifts with them! oh, that looks great! really good way of recycling magazines! Funny - I made the EXACT same bow as the green one you show. The page was a magazine ad for some sort of natural laundry detergent. Too funny! I made this bow from a laundry ad because the present was cleaning related. No one probably knew but me, but I thought it was quite clever :) I think it'd be fun to have clues hidden in the bows. No way! That's funny. And I hope your gift recipients discovered your cleverness. I love it. So beautiful! I tried a few bows over Christmas, none picture worthy. I'm going to see if my 2nd grader can follow instructions and make a bow. She's pretty good with arts and crafts... Maybe it'll be onto her class as a craft project for their Valentine's party?! I made dozens of these bows also! So fun and each is unique! I loved the tutorial. It is so neat to see a whole bunch of these. I wish to make a lot of bows so I have a stockpile ready for gifting. Keep blogging. Thanks. I couldn't even find my ruler, but I did a good estimate... just to see how it would look. I used colored printer paper. I can already see that I will be using these from now on. Thanks much! I tried these too! Used old google earth/map print outs. The final result is very cool~! How fun! i love recycling mag papers for projects! great idea. i did not buy bows this christmas at all- just went through old magazines and followed the instructions. i am new to all things crafty or domestc but i loved making these. cheers for the post! i have become addicted to making these, if for no other reason than the raised eyebrows of friends and the 'where did you get a kings of leon christmas bow?' comments. thanks! very cool idea! thanks for the tutorial! I look forward to trying this out myself and sharing the info on my blog! I absolutely love these! Can't wait to give them a try.